The Orlando Airport… it always leaves me with the impression of it’s complete and utter predictability. You have two types of travelers: the Disney families and the Conference Goers. The Disney Families are excited and pale on arrival and depart sun burnt and cranky… with. out. fail. More than not, when you take a gander at the ceiling in any given section of the airport, you will see at least one Mickey shaped balloon that has gone astray. Now, the “family” definition could be further expanded to included the “groups”. While there are fewer of the groups, they are easily identified by the matching t-shirts and occasional flag carrying leader… these troupes and their invariably neon shirts make me smile every time. Sometimes they even have walkie talkies, bless ’em. You also have the “teen” groups. They are of debatable age but they act like 16 year old on their way to band camp… these aren’t so fun. I pose the hypothesis that the busyness of the airport is less related to the holiday schedule as it is in direct relation to Disney deals and conferences. Orlando has a crazy number of hotels. Nifty little factoid for you: Orlando and Las Vegas battle it out each year as to who has more hotel rooms. I’m not sure who’s up at the moment but I have a feeling it’s Orlando. We also have the Orlando Convention Center which I think is about double the size of the airport. You do not want to get lost in that building. I often find it odd the things you can buy in an airport. As I write this I’m hanging out near a Crocs kiosk. Why would I buy shoes at the airport? Maybe it’s attributable to the Conference Goers. Wearing those heals running miles at the convention center for a week… I guess I’d be tempted to buy some Crocs for the travel home as well. The books and magazines are oddly more tempting for me… to be honest, as a pathological impulse buyer, the entire Hudson News stand is tempting. Here’s a question for you: are you for or against bringing food onto the plane? Okay, I know, airplane food seriously leaves something to be desire but there is something cruel about the guy who whips out his McDonalds fries during take off. It’s torture. I treat myself to Starbucks immediately after getting through security. I’m always chugging it down because I don’t want to be that person who carries coffee onto the plane then, while struggling to get her carry-on into the overhead bin, pours said coffee onto one of the sore-footed Conference Goers in his way-to-expensive suit. I just can’t bear the thought, so I chug. The chugging of coffee brings up another airport issue… well, more like an in-flight issue. I can’t stand going to the bathroom on an airplane. I managed to make it from New Jersey to Dublin without peeing. It’s an art, I know. BUT, as you may have experienced a very particular personal effect that coffee has on the digestive system, I always worry that the chugging of said Starbucks delight will intensify the negative possible side effects. There is a lot of praying that happens but the worry isn’t enough to deter my from my Venti Soy Latte. Another travel novelty, although it doesn’t really have to do with airports or flying, is the dramatic weather changes from one location to another. Florida is humid. Period. It is always humid even when it’s “not humid.” I travel mostly North seeing as I’m pretty much as South as one can get so there is almost always the cool relief when I land in a new place. Traveling to see my sister in Vermont.. it’s usually ridiculously drastic. For example, it’s a refreshing fall day in Orlando so naturally it’s about 80 with a couple degree heat index. Not bad, if you live here. I haven’t had my air on for weeks. I’ll be in Vermont in about 4 hours and it’s approximate 30 degrees. Yes.. a 50 degree difference. YIKES. At least once I’ve left my coat on the arm of the couch at home only to arrive in Vermont with only a t-shirt on my back. Swell. I can’t actually remember a time that I traveled anywhere that was warmer than Orlando. Wait, that’s a lie… I went to the DR in December and it was quite nice. Returning to Orlando, especially during the winter, is, well, terrible. No matter how nice you thought it was when you left (80 degrees) you arrive and feel the humidity instantly. You get out to the pick up loop and you literally want to strip. I’ve been known to take off shoes and socks. It’s like walking into a sauna fully clothed… ew. Airlines. I ❤ Jet Blue. I’m a tall girl, they have leg room, enough said. But not really enough said. They have TV screens in the back of every seat with satellite TV and standard ear phone jacks so you don’t have to buy their special pair. And if you do need to buy a pair, they are only $2… nothing is only $2 these days. They serve a variety of complimentary snack and drinks. I just heart them. The End. The Disney paraphernalia has been replaced by Cowboy hats and boots. While the business-types are always prevalent, the red-faced tourists have disappeared and hippie looking guys with guitars have filled in the difference. I feel like I should tote my guitar along with me when I come to Nashville so I can look like I have a legitimate reason for being in town. I realize that Starbucks in any city/airport is still a Starbucks… and I’m grateful. I guess that’s it for now. What about you? 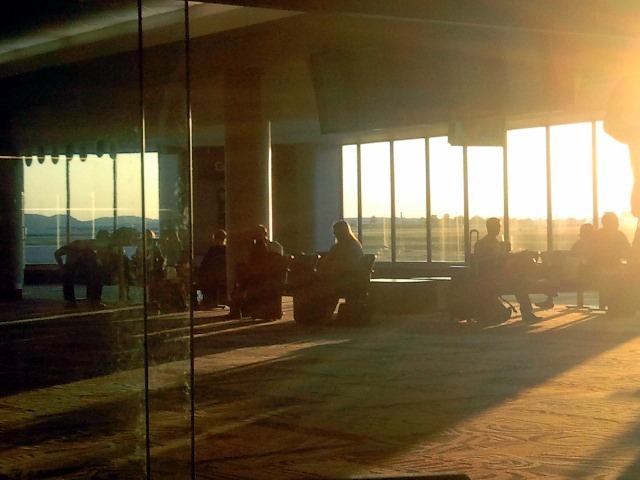 Any profound (or not so profound) airport observations? While you think about that… I’m going to go back to people watching and see if I see anyone famous. ‹ Previous2nd Annual Bao Fest!